TB DialOut is great. Have been using it with x-lite/eyebeam. Question, any chance of sharing your perl script or info how to use it with a desktop sip phone or pbx ? It would be great to be able to dial via computer and use the hard phone–I’ve just got a Yealink TP28 Sip phone. You seem to have cracked that. I wrote a small program to pass the required Phonecall via Manager Port to my Asterisk PBX. I think your ADD-ON may be very useful. Unfortunately I have upgraded Thunderbird some days ago to 5.0. That was before I found your ADD-ON. Will you support TB5.0? I am planning to use it with sipgate. Any experience? 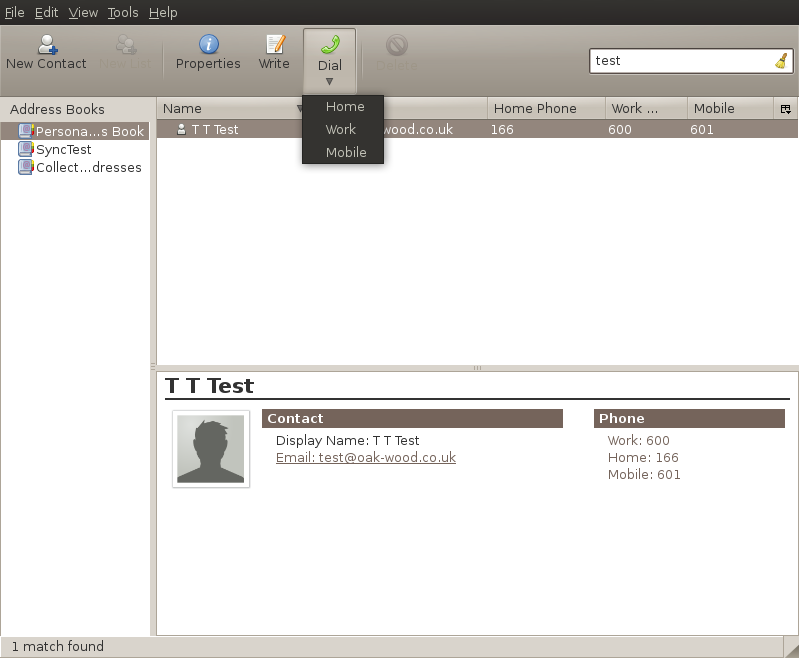 I have tested TBDialOut w/ TB5.0and in spite of complaints from the ADD-ON manager it works. Great! So far I am using it with Skype. I would like to use it with sipgate. It’s a sip VOIP provider. Is there any instruction on the web you know of to install a URL hander for this? Thunderbird 5.0 has just been released, but it claims TBDialOut 1.5.2 is incompatible and disables it. Any chance of an update soon? I am trying to get me and my team to be able to dial throug our office Cisco SPA922 VoIP phones by clicking on TB’s address book. We have found a couple of (paid) applications that can tell the SPA922 to make the call, but they both work by monitoring the windows clipboard. Is there a way to add an option in TBDialOut to copy the number to the clipboard? Of course, if you have any other suggestions on how to get the job done they are most welcome! Thanks for your attention and thanks again for sharing your work. I’ve been on holiday with no internet connection for a while, so sorry for the delay folk. I’ll try to get a TB 5 compatible version done pretty soon. Thanks to Eduardo sounds like it should be straightforward. I’d rather not work on an option to copy a number to the Windows clipboard, if only because I don’t use Windows 🙂 If you can find out how these paid apps interact with the phones I can look at that – the phones presumably have some sort of API for setting up calls. Also, how are you’re phones used? If they are all connected to a soft PBX such as Asterisk, it might be possible to interact with the PBX instead. This Program is testet on Windows 7 32bit an Asterisk 1.8.x.x !!! A click on callto:[Phone-No] transfers the requiered call No. via Asterisk Manager Interface (AMI) to my Extension (Hard- or Softphone). It’s probably useful with other devices too. The new URL features sounds great. Unfortunately I am using a Grandstream GXP1450. I believe that it does not support dialing by URL command. Or does it? Very nice extension. The latest 1.7 version work well for me if used directly with asterisk AMI (ie port 5038). Unfortunately I must use astman proxy and it doesn’t work at all. Are you aware of this issue? Thanks for bringing this problem to my attention. I’m really short of time for the next few months so I’m afraid it may be a while before I can look at this. I don’t use astman myself so I’ll need to set that up before I can really investigate the problem. nice extension. I want to use the URL command with a Cisco 7945. Unfortunately, it doesn’t work. If I enter the same URL in a browser (the local address of the webdialer), the phone dials the number. What’s wrong? In version 1.7.1 I have added an option that will allow you to use Cisco webdialer. There are instructions no the main TBDialOut site http://www.oak-wood.co.uk/tbdialout. Basically, you have to uncheck the new ‘Open in background’ option. Hi, I have a feeling I’m wanting this extension to do something that’s actually impossible, and maybe someone can confirm that. I don’t have a phone server and don’t know what a ‘URL scheme’ is but rather I just have an old-fashioned regular telephone plugged into a wall outlet and that has nothing to do with my computer. I just remember the old days when I had a dial-up modem and the phone plugged into that, and I could make a call from my computer’s address book. Given that I’m now on Verizon FIOS for both phone and internet, and given that I have all my phone contacts in the Thunderbird Address Book, is there a way I can have Thunderbird dial these numbers out on my telephone? It seems such a waste to have all these phone numbers in my computer but no way for the computer to dial them. Thanks for any help. I’m trying to set up my e-mail program Thunderbird with the add-on “TBDialOut 1.7.2” to dial directly from my address book a telephone number. In the add-on I have chosen the function “callto:” (other choices: “tel:”, “sip:”, “skype”, “custom URL” and “Asterisk AMI”). I associated the “callto:”-option with the Voip-client “C:\Program Files\VoipCheapCom.com\VoipCheapCom\VoipCheapCom.exe”. Now after I press a telephone number from a contact in my address book, the voip client opens but nothing else happens, meaning the number is not dialed. I don’t know VoipCheapCom and I don’t know if it is possible to pass a phone number to it on the command line. This is necessary in order to register it as a protocol handler for callto:, or any other protocol. You will need to check with company that produces it. If it is not possible, an alternative would be to use a different softphone, such as X-Lite, with your VoipCheap.com account. They have instructions for doing this on their site. If you do manage to get VoipCheapCom working please let me know so that I can add it to the FAQ. I am trying to use TBDialout extension for using with Address book. I want to call using the address book with modem and headphones. I am getting error message probably due to some configuration required in the call to: option ( I guess). Please help how to make it work. I am trying to use dialer.exe (Windows XP). I don’t have access to a modem so I don’t really know, but if the modem conforms with TAPI you may find this faq useful. Nice Extension, works very well! After hours of testing I finally found the solution why the phone was ringing but it wasn’t connected to the dialed number.